Life took over and threw a few curve balls. The busy-ness of work and a few days of unfortunate news resulted in a short hiatus from the posts which are Proekt 365. Despite a lack of posts, I have been taking time out each day to revel in the little bits of goodness around me. And, there are many even on the gloomiest of days. Today, though, provided a bit of comedic relief. I’ve recently returned to the life of gym bunnies and joined a local fitness centre. It’s a great, no frills sort of place, with a dedicated women’s only section. No classes, no annoyingly cheerful and well-toned (if not ridiculously young) staff watching to make you feel even more self-conscious—just a bunch of equipment and locker rooms and 24/7 access. And, others hoping to get fit and stay in shape. In addition to being generally impressed with how low-maintenance the whole process has been thus far, many of the signs hung throughout are written not just in Finnish, of which I understand nothing, but also feature English. I greatly appreciate this bi-lingual attention. But, it also provides a bit of insight as my friend pointed out in just how different English and Finnish are to one another. Case in point, the picture above. The upper portion of the sign in the Finnish seems a little less cumbersome and wordy in English. 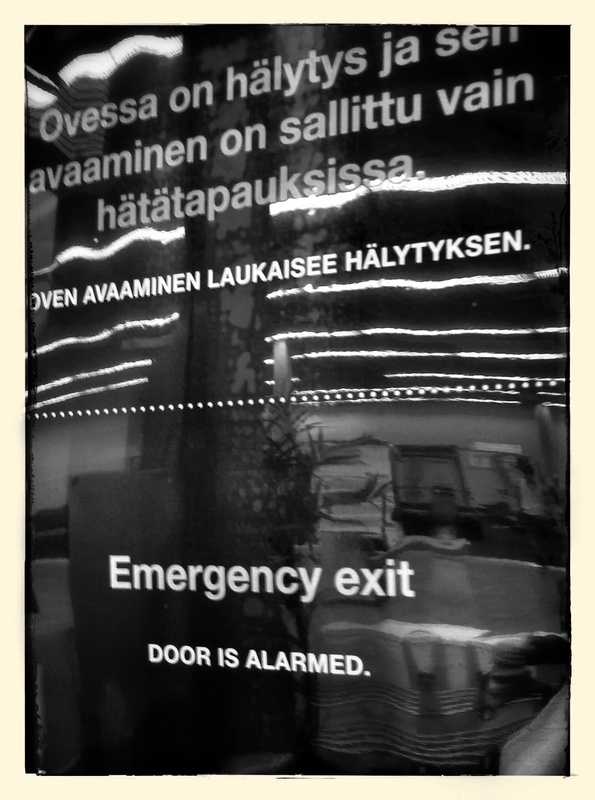 The information in both languages, according to my friend whose Finnish is amazing, is the same. It just takes a bit more work to convey the same message in Finnish, evidently. Oh, Finland. With signs like this, my hope of ever learning any of your native language is once again dashed. Ah well.